Like last year, my landlady insisted I come see her puja room which she has specially decorated for Dasara. 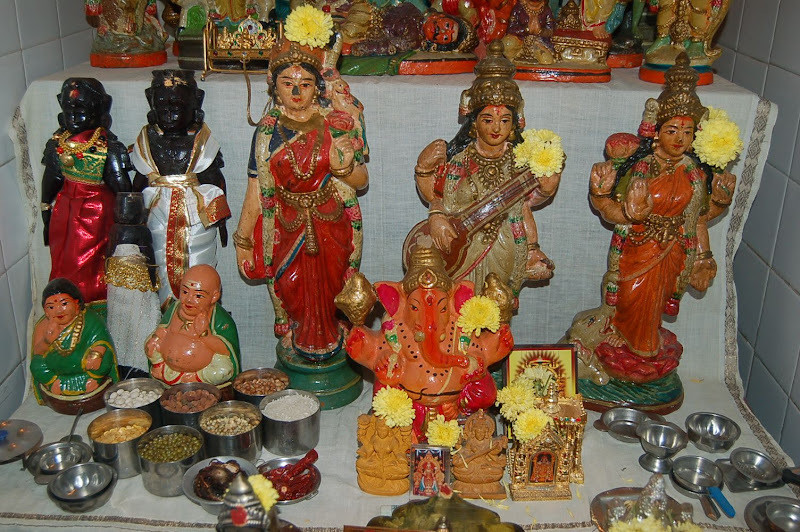 Every year on this occasion, she brings out all her painted statues of gods and goddesses and proudly displays them for 10 days in her puja room. She explained that she has had these statues for the past forty years: “These are antiques!”, she told me proudly. The small puja room was crowded with the full pantheon of Hindu gods and goddesses. 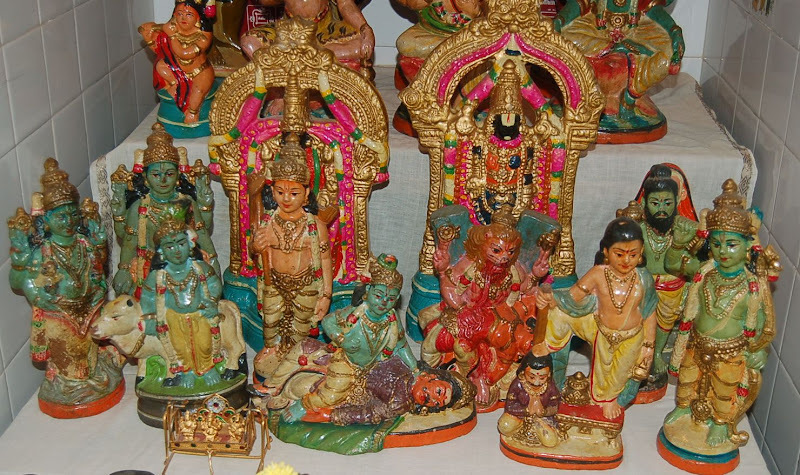 The Hindu trinity of Brahma, Vishnu and Shiva had their prominent places on one shelf, while the Dasavatar (10 reincarnations of Lord Vishnu) occupied a whole shelf underneath, jostling for space with Lord Venkateshwara and Princess Padmavati from Tirupati who were observing the whole scene. The goddesses Parvati, Saraswati and Lakshmi were also there, showering their auspicious blessings on the whole household and ensuring success in spiritual fulfilment, learning, and wealth and prosperity respectively. There were also two black statues. I don’t know who they represent but she told me they are ‘very important’. 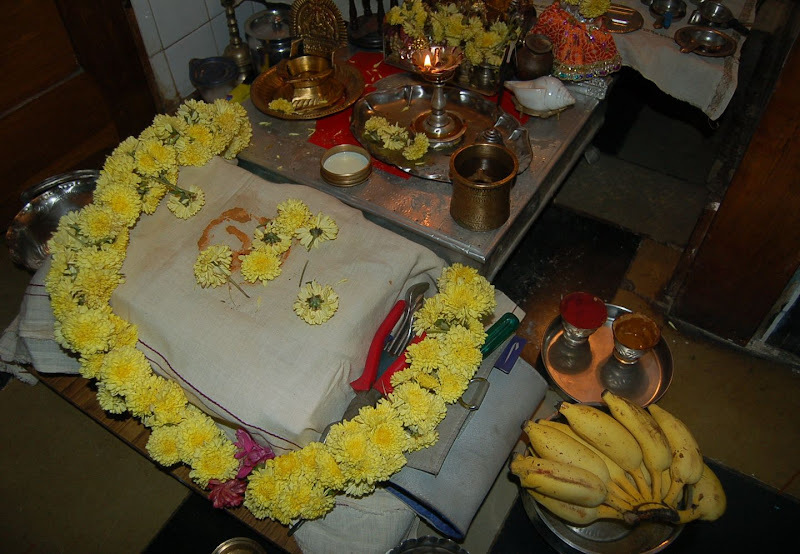 Today being Ayudha puja, she had also laid out her husbands’ tools and children’s books so that they could be blessed and continue to bring their owners success. Before I left, she gave me a few bananas and put a tikka on my forehead with red and yellow powder and made me promise to send her the photos I took of her puja room to her email address so that so that she can send them to her daughters who live in the US. Tomorrow is the last day of Dasara and a public holiday. Happy Dasara to everyone! Did your landlady give you a blouse piece too? Usually my mom got a blouse piece, a coconut, and bananas from the lady of the house we went to ..
Hi Venkat! No, unfortunately I didn't get a blouse piece and I politely declined the coconut because I had already received 2 at a wedding a few days before! That's cool..my mom always got slightly annoyed whenever she got blouse pieces because that meant that she had to buy matching sarees, which obviously involves a lot of money!